The two hottest poker rooms on the Revolution Poker Network have just started a new online satellite tournament series where you can win your way to the Caribbean. 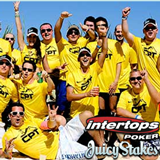 Intertops Poker and Juicy Stakes Poker are co-hosting CPT Punta Cana online satellite tournaments that will award the winner with a $4000 prize package to play in the CPT Punta Cana Main Event this November. Register for the three-tier online poker tournament series under the Tournaments tab in their poker room. The $4000 prize package includes $900 Buy-in to the CPT Punta Cana Main Event (November 6th – 8th, 2015), 6 nights at the five-star Hard Rock Hotel and Casino Punta Cana, meals and beverages, travel expenses and $1500 in Resort Credits. Online champion will win $4000 prize package to play in live poker tournament in the Caribbean. Joining winners of satellite series held earlier this summer, the winner will take a seat with a mixture of amateurs and pros at the CPT Punta Cana Main Event where American poker pro Ari Engel won $177,045 last year. Step 1 tournaments are held six time a day until July 29th. The Final will be August 9th. Another series of online satellite tournaments just ended. Mika P. aka “VibeKing” won the Final and a $3100 (€2750) prize package sending him to the Estrellas Main Event in Barcelona next month. Like other online tournament winners, he’ll share his stories and photos from that event on the Living the Dream poker blog.